megan was born in Georgia, grew up in Alabama, and went to kindergarten twice. she has never broken a bone nor is she allergic to anything, but is prone to chronic nosebleeds as well as self-derisive thinking. at the tender age of three weeks, megan underwent surgery for pyloric stenosis, a condition usually only found in first born male infants. she still has the scar. she will show you if you ask her, but it makes her tummy crease over like a fat roll and she is very self conscious about it. megan is eager to please, quick to crush, but slow to love. she is not jewish, and yes, her hair came this way. megan is a weirdo from a weird family. she is forever indebted to these weirdos. her earliest dream was to be Jennifer Connelly in Labyrinth and her latest unfulfilled dream is to play the first female Willy Wonka. 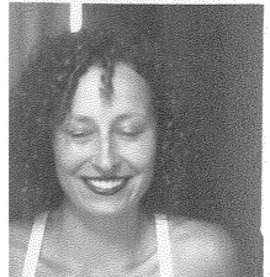 the hardest part about being a Neo-Futurist so far is the photo booth photo. a born leader, she served as secretary of the Whitesburg Elementary student council, was runner up for student council president at Huntsville Middle School, and was elected French Club president twice. thanks to senior class president-elect Joey Bailey’s decision to leave high school early for culinary college, she acted as senior class president of 2002 at Huntsville High School. she was also voted “most likely to be president,” but has decided not to run given the likelihood of triumph. megan prefers to try things she may potentially fail at. in early september 2008, four months after earning her undergraduate degree and being cast in the ensemble, she found herself squeegee-ing a parking lot at DeVry University in the driving rain. that day, she went home and cried in the shower before settling down to Bring It On 3 and a bowl of chicken noodle soup. she would now like to thank every single teacher she’s ever had in her whole entire life. your patience, generosity, and encouragement is and will forever be invaluable. i am everywhere I am because of you! *true story. It cost her 50 bucks to get her bike cut from the rack outside only to find that it wasn’t properly locked in the first place. sheesh.